Mosaics: Muslim Voices in America explores the breadth of American culture through the lens of Muslim artists living and practicing in the United States, with a focus on personal narrative. This project envisions a mosaic of stories to celebrate the diversity of Muslims in America. Moraine Valley Community College Fine and Performing Arts Center has been awarded a grant from the Association of Performing Professionals (APAP) for the Building Bridges: Arts, Culture and Identity program. The grant program supports mission-critical projects that demonstrate the power of the arts to strengthen communities and increase intercultural understanding across America. The Building Bridges: Arts, Culture and Identity APAP grant program is supported by the Doris Duke Charitable Foundation (DDCF) and the Doris Duke Foundation for Islamic Art (DDFIA). Sponsored by the Doris Duke Foundation for Islamic Art and APAP. Chicago Dance Crash presents "Nafs" an original choreography by Amirah Sackett. In this new program from Jeannette Sorrell, music and poetry evoke a “tour” of the Jewish, Christian, Arab, and Armenian quarters of Jerusalem. Selections from Monteverdi’s Vespers of 1610 echo the rapturous singing of Jewish cantors in the temples. Medieval harp, oud, and exotic percussion blend with Arabic love songs and Sephardic ballads. The performers, including musicians of Jewish, Muslim, and Christian backgrounds, join in a celebration of brotherhood and sisterhood. East Meets Middle East is a musical collective across continents celebrating the rich traditions of the Middle East and South Asia. From India, Subrata Bhattacharya (tabla) and Abhisek Lahiri (sarod) collaborate with Ronnie Malley (Oud) and George Lawler (percussion) to create a cross-cultural palette of improvisations and original compositions. The group transcends boundaries as they move through raga and maqam, tala and iqa, the music theories and rhythms found in South Asia, the Middle East, and North Africa. ​Recently wrapped up a production of Macbeth directed by Aaron Posner and Teller (of Penn and Teller magicians) at the Chicago Shakespeare Theatre on Navy Pier. ​ What a magical experience it was to be part of this marvelous production. I played Hecate, ruling the underworld with music and sound alchemy. Proud to be part of the sound design team with Andre Pluess and Chris Laporte. A special congrats to all for winning the 2018 Jeff Award for Best Sound Design! Join Surabhi Ensemble as they celebrate the release of their new album. This dynamic group performs music and dance from Indian, Middle Eastern, African, and Spanish traditions. 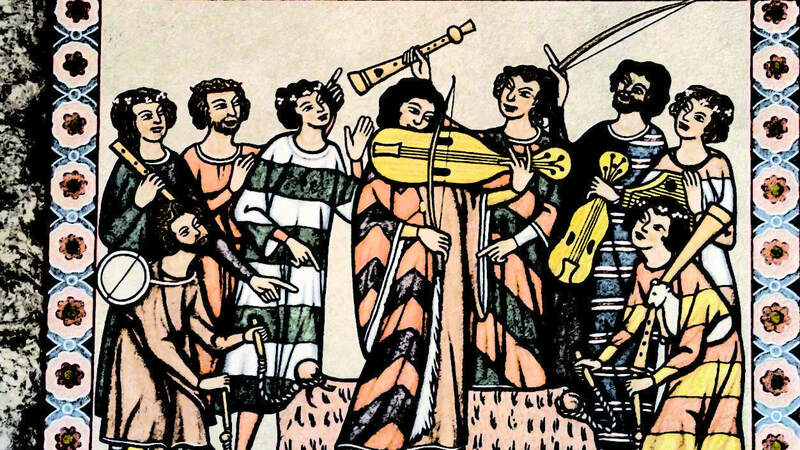 Music of faith and longing from Renaissance Spain and the Ladino oral tradition of the Sephardic Jews. The series celebrates the shared cultures of Abrahamic traditions from Andalusia and beyond. An original play written and performed by Ronnie Malley. who traveled from Baghdad to Muslim Spain and shifted the course of history.